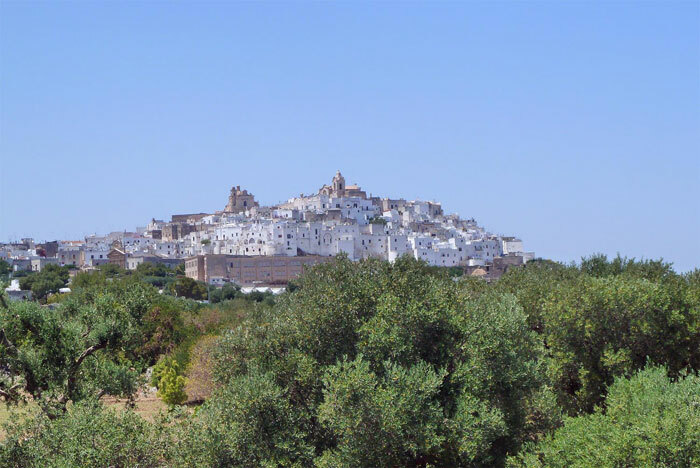 Ostuni rises on the last patch of Murge; 240 meters above sea level, is 6,625 km far from the Adriatic coast; it enjoys a healthy climate and charming and peculiar panoramas. The old suburb culminates with the Cathedral built in delicate stone between the end of the XV and the beginning of the XVI century, in Roman-Gothic style; in front of the homonymous square towered above by the Arco Scoppa that joins together the Palazzo Vescovile with the former Palazzo del Seminario, today used as Library and Diocesan Archives. 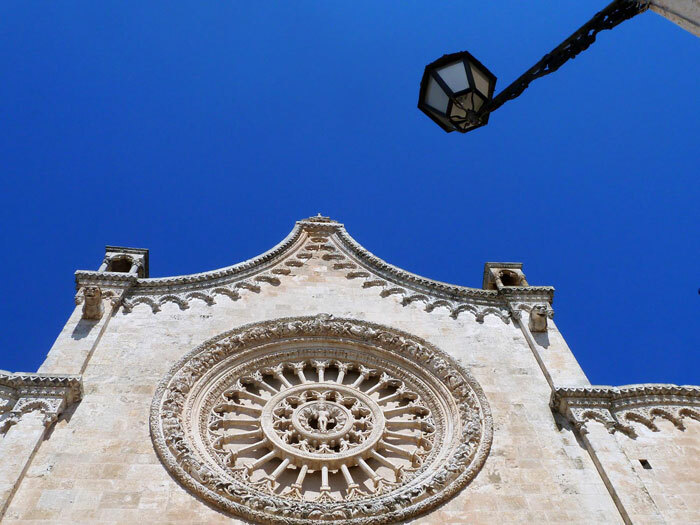 The facade of the Cathedral is dominated by the central rose window, unique in its kind, representing, at the centre, the Blessing Jesus, God Father along its perimeter and twelve minor prophets. The inside, with three aisles, keeps Baroque wooden altars, frescoes and valuable sculptures. Among the most characteristic areas of the town there is also Piazza della Libertà, designed in 1861 by architect Ferdinando Ayroldi, built in 1870 following the demolition of ancient medieval buildings, saving the former friary of the Conventual Franciscan Friars that had become in 1887 the Palazzo di Città and the magnificent steeple of St. Oronzo, Patron Saint of the Town of Ostuni, erected between 1756 and 1771 by the Ostuni sculptor Giuseppe Greco. 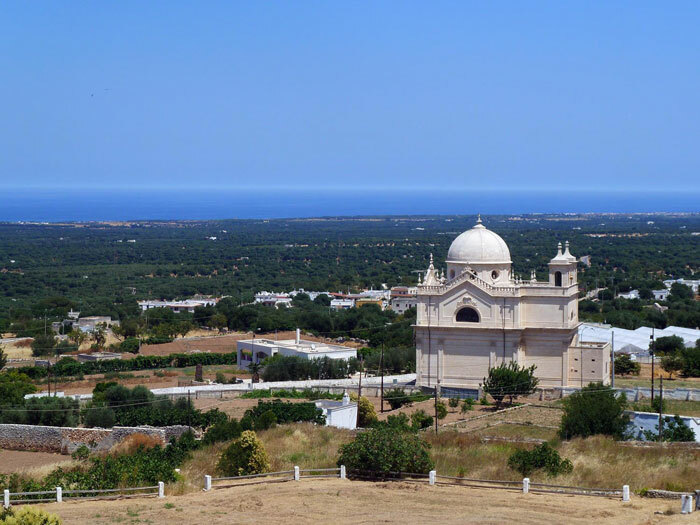 Moving few kilometres from the built-up area, along the former highway 16 Ostuni-Fasano, we enter the Archaeological and Natural Park of Santa Maria di Agnano. 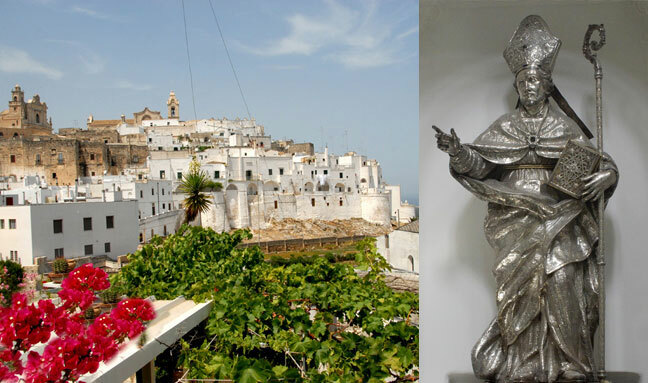 Placed on the homonymous�hill, it keeps the maternity grotto where the pregnant woman defined “The most ancient mother of the world” of the Palaeolithic “Ostuni 1” has been found. 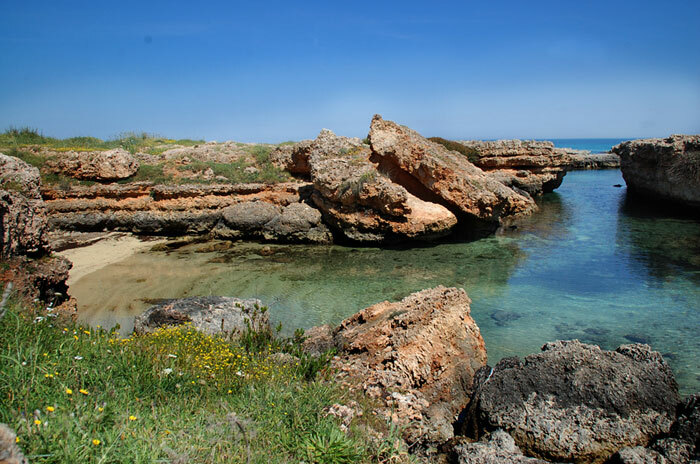 The archaeological and naturalistic area offers to the visitor evidence of a far-off times that returns in the present even through ancient species, typical of the Mediterranean flora. 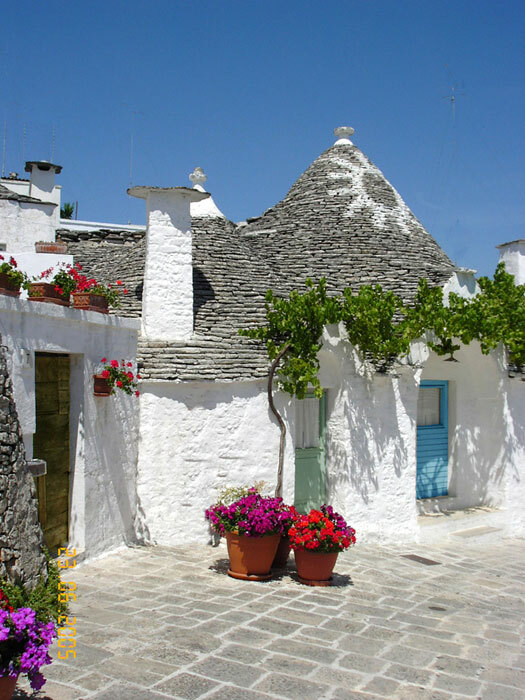 In the end, it is important to remember that FEE, the Foundation for Environmental Education, awards Ostuni for the 17th year, assigning the Blue Flag, while Legambiente confers the “5 Sails” for the third consecutive year. About eighteen kilometres of coast, alternating with long beaches, sandy creeks, rocky inlets, wonderful foreshores, with the Port of Villanova, the Coastal Dunes Park, the Coastal Towers, represent a unique beauty mitigated by the Adriatic Sea and by the cool north winds.